Little is known of Bob's early life, however his career as a children's entertainer started as the non-speaking sidekick on Krusty the Clown's television show. 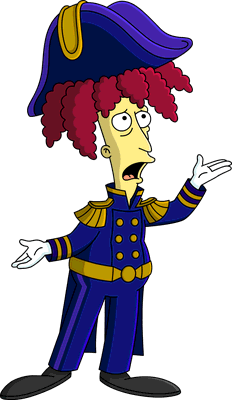 Bob only received the job after his younger brother Cecil Terwilliger failed an audition, because Krusty considered Bob to be a perfect comic foil. After repeated instances of abuse, including being shot from a cannon and hit constantly with pies, Bob became angry at Krusty and resentful of the clown's success. Enough of Krusty's torment, Bob framed Krusty for armed robbery of the Kwik-E-Mart. After Krusty is arrested, Bob takes control of the show, introducing children to elements of high culture. However, Bob's reign is short-lived; Bart Simpson exposes the plan, Krusty is released, and Bob is sent to jail, but not before swearing vengeance on Bart. During his time in prison, Bob won an Emmy for his role on The Krusty the Clown Show, but his award was confiscated by the prison guards. Bob took part in a prisoner dating service, and went into a relationship with Selma Bouvier, the aunt of Bart. After he was released from prison, he proposed to and married Selma, despite Bart's protests. As part of a scheme to inherit money she has invested in the stock market, Bob attempted to blow Selma up during their honeymoon. However, Bart again foiled the plan and Sideshow Bob returns to prison, exclaiming that as soon as the Democrats were back in office, he and all his criminal buddies would be back on the streets. Ironically, he'd run as a Republican in a later episode. 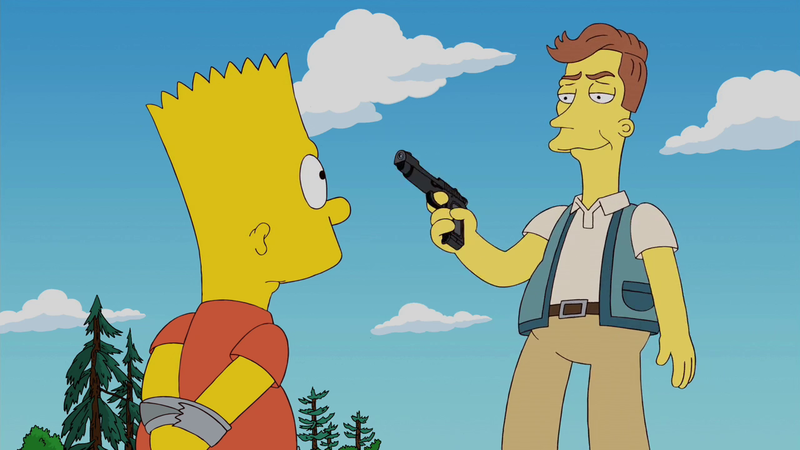 After being paroled from prison, Bob targeted Bart directly, threatening him repeatedly and forced the Simpsons to move to Terror Lake as part of the Witness Relocation Program. Bob followed them to their houseboat and, after subduing the family, prepared to kill Bart. He allows a final request, however, and Bart asks to hear the entire score of H.M.S. Pinafore. The delaying tactic lead to Bob's third arrest. Bob was released from prison once again after conservative commentator Birch Barlow convinced the public that Bob was a political prisoner. After being released, he ran for Mayor of Springfield on a Republican Party ticket. He defeated liberal incumbent Joe Quimby in a landslide, and used his power as mayor to propose the demolition of the Simpsons house to make way for an Expressway, and sent Bart back to Kindergarten. Bart and Lisa later discover that Bob rigged the election, leading to another incarceration. 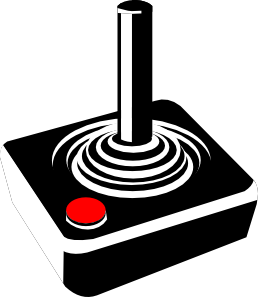 During his prison sentence, he began to develop a growing dislike of television, calling it "a fountain of mindless drivel". While doing community service at an Air Force Base before an annual air show, Bob escaped from his work duty and sneaks into a hangar in the base disguised as an officer, where he found a Nuclear device. During the air show, coincidentally being attended by the Simpsons family, Bob appeared on the television screens and threatened to blow up Springfield with a nuclear bomb unless the city stops broadcasting all television shows. When confronted by Bart and Lisa, the bomb is discovered to be a dud, and Sideshow Bob instead kidnaps Bart and hijacks the Wright Flier, planning to crash the Flier onto a shack where Krusty was broadcasting an impromptu TV show. However, the plan fails, and Bob returned to prison. During yet another prison sentence, Bob took advantage of the prison's Christian outreach program, and appeared to be genuinely redeemed. Reverend Lovejoy declared him a changed man and recommended him for a work release opportunity. Bob is discharged from prison into the care of his brother Cecil, who was Springfield's chief hydrological and hydrodynamical engineer. However, the scheming Cecil, still smarting over his failed audition for Krusty, tried to frame Bob by sabotaging the Springfield Dam. Bob, Bart, and Lisa together stopped Cecil and saved the town. However, both brothers were sent to prison despite Bob's genuine innocence. When Krusty announces his retirement due to low ratings, Bob discovered from prison that Krusty has erased all of the early shows featuring Sideshow Bob. Bob is released from prison and developed a plot to kill Krusty. Using his new job as an intercom announcer at Springfield Elementary School, he corners Bart in a shack off the school playground and hypnotized and brainwashed Bart, planned to use him as a suicide bomber during Krusty's final retirement show. However, when he overhears Krusty express regret about mistreating him, Bob decides to abort his plan, and although he is returned to prison for attempted murder, Krusty thanks him due to the fact that his show's ratings soar back up every time Bob tries to kill him. Sideshow Bob, as a result of his attempted murder, was also originally going to be executed by the Guillotine, but Bob reminded Chief Wiggum that he was supposed to get a trial before committing the execution, causing it to be revoked and spend time in Jail. After a murder attempt is made on Homer Simpson's life, Bob was temporarily released from prison to help find the culprit, much to the dismay and horror of Bart and Lisa. To keep him from trying to commit crimes, the police attach a shock garter to Bob's leg and gives the family a remote that shocks Bob at the push of the button, which proves effective. However, the family, mainly Bart, misuse the purpose of the remote, shocking Bob just for being too smart. During the course of the case, Bob actually saved Homer after an attempt on his life. When the mystery is solved, he returned to the Simpsons home to murder Bart. However, Bob found that he was "accustomed to Bart's face" and cannot do it. Bob did not return to prison and decided to move to Italy in order to make a fresh start. After gaining fame for his wine (his exceptionally large feet made him a perfect grape crusher), he became the mayor of the town. He married a local woman named Francesca, with whom he has a son named Gino. The Simpson family encountered him by chance after coming to Italy to retrieve a car for Mr. Burns. Bob welcomes them with hospitality on the condition that they not reveal his felonious past; however, a drunken Lisa (drunken on wine, yes) jokes about Bob's criminal deeds, alienating Bob from his citizens. He, his wife and son swear a vendetta on the Simpsons. On another attempt at Bart's life, Bob lured the Simpsons family into a fake rib restaurant, and tied the entire family up, planning to kill them with the explosion of an overheating laptop next to a pile of TNT. After Bob misquoted several lines on Shakespeare, Lisa managed to trick him into checking a line from a Shakespeare play on Wikipedia, resulting the laptop to explode on his hands. During the trial, Bob's father, Robert Terwilliger Sr., testified on the stand, explaining that Bob had a rare heart condition, and also suggests that Sideshow Bob is insane because of his long-standing feud with Bart. This convinced Springfield that in the long-run Bart is ultimately to blame, and they turn against him. As Bart pleads his innocence, Bob takes out a vial labeled nitroglycerin, which Bart snatches and throws out the window, thinking it was an explosive. The vial was actually Bob's heart medication and he collapsed on the floor, unconscious, and was pronounced dead. In reality, Bob was actually faking his death and put in a temporarily death like state, as his father injected him with a anesthesia. His entire family was assisting him to kill Bart. When a guilty Bart visits his coffin while being led by Cecil, Bob leaped out of the coffin and trapped Bart inside, to be cremated inside the coffin. The Simpsons family save Bart just in time by blinding Bob with unclaimed ashes. Bob's entire family, including his Italian wife and child, and his brother and parents, were sentenced to an 87 year prison term, and Bob was put in a straitjacket. 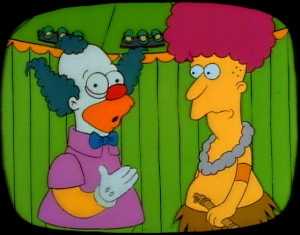 Sideshow Bob was briefly seen escaping from prison and visited Krusty the Clown for the week. Bart and Lisa traced Sideshow Bob to a cabin thinking he was prepped up to kill Homer Simpson (Homer went missing at Marge's third wedding and thought Sideshow Bob was the culprit due to a clue, keys with the letters "SB" on it, being left in the groom's room. ), only to discover that he was actually trying to aerate a bust of Krusty that he was sculpting. Krusty also explains that Sideshow Bob couldn't have kidnapped Homer Simpson because Bob was with Krusty the whole day. When Lisa questions him about the keychain, he explains that, although it's nice that they thought of him, the initials don't just pertain to him, and gives a list of people whom "SB" could refer to, including Selma Bouvier, the actual culprit. Eventually, he managed to return to jail again (exactly how or why is never explained), where he is bullied by Snake. Sideshow Bob later arranged to have face-switching plastic surgery done between himself and a fellow inmate, Walt Warren, so when he tried to kill Bart, people would assume that Sideshow Bob was actually still in jail. The plan easily fooled Bart when he suspected Walt of actually being Bob. Bob took Bart to the Five Corners, planning to kill Bart and have each step of the murder take place in a different state, thus avoiding prosecution because no single step was illegal in itself. However, Walt managed to foil his plan and the police from all five states trapped him. It is assumed that Walt and Bob got additional plastic surgery to return to their original true selves as Bob was recently seen at a town meeting in his original self. Sometime before the Simpsons traveled to New York a second time, Sideshow Bob was released from prison. Mary Spuckler and Bart were on a bridge together when Mary asked about what's happened in Springfield. Bart said that Bob was released from prison again, and just then Bob came out of some bushes and holds his knife up, having possibly followed the family to New York. Before he can kill Bart, a train crosses the line, sending Bob with it. It is unknown what happened after that. It would seem that Bob was returned to prison, where as punishment he was forced to create vanity license plates, with the lowbrow humor of them slowly driving him insane. He gladly volunteered for testing when representatives of Monsarno came to offer him a job as a lab rat. Afterward, he prepared a presentation of scientific findings which so impressed the scientists that he became a member of their full time staff. After Lisa preached the benefits of genetically modified organisms, Monsarno offered her and the rest of the family a tour of the facilities, where to their horror they discovered Sideshow Bob. He seemed to be a changed man, and Lisa noted a connection between her and Bob in their shared affinity of high culture. Bob asked that the Simpsons return for a visit, with only Lisa complying. On a trip to the Springfield Museum, Bob saved Lisa from being crushed under a falling exhibit, revealing that he had modified his own DNA and became super strong. He revealed his plot to take splice his DNA with Einstein among others. He then attacked Lisa and the spying Bart, displaying the abilities of sonar and grasshopper-like leaping, as well as cranial kinesis before realizing he had become a monster. After parting words with Lisa, he leaped from Springfield Dam. With everyone present believing him dead, he was easily able to escape thanks to the gills he had given himself. Bob was briefly allowed out of prison to attend the funeral of Rabbi Krustofski. A drunken Sideshow Mel got jealous as Krusty had once claimed that Bob was better than him. After Bart had driven off his substitute teacher Mr. Lassen, Lassen became a security guard at the prison. He met Bob and saw that he also hated Bart. Lassen offered to help Bob escape so they could team up to get Bart, however Bob didn't like Lassen's idea about how they would actually kill Bart and rejected the offer. He is tall with slender limbs and a plump paunch. His favourite weapon is a carving knife, which he is regularly depicted holding. He was born on October 11, 1957. He is also 41 years old, and has been on the show from 1984-1990. Sideshow Bob's defining feature is his curly, palm tree shaped red hair. His hair is exceedingly long when wet, pulled or brushed. It tends to recoil and bounce back into shape with great ease. He used to wear his hair in a sphere sort of shape. Sideshow Bob has unusually over-sized feet which have been used as an advantage, and disadvantage to him. They once helped become the mayor of a village in Italy, as his feet helped him crush grapes a lot better and quicker than the other townspeople. They were a disadvantage to him when they helped Bart find our that Bob framed Krusty. When Bob robbed the Kwik-E-Mart, Homer stood on the end of his long shoe, which he felt. However, when Kusty was being taken to prison, he had very small shoes on his feet. Bart later saw Sideshow Bob in his office with no shoes, which later helped him work out that Bob framed Krusty. Bob's large feet also helped the Simpson family understand that Walt Warren was not Bob. He can, however, bend his feet forwards so he can fit them inside smaller shoes. Back: Bart's Head (decapitated) on his skateboard, with a speech bubble, saying, "Ouch, Man!" The tattoos have generally not been shown since, though it has not been confirmed if they have been removed. 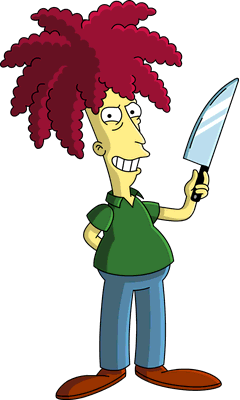 Sideshow Bob in a way-mirrors Hannibal Lecter - a psychopath, who could recite Shakespeare by heart, while stabbing you with his knife. Sideshow Bob enjoys the finer things in life, including reading classical literature. Likely due to his upbringing, he has a passion for theatre, knowing Gilbert and Sullivan's H.M.S. Pinafore off by heart as well as Shakespeare's works. In contrast to his love of the 'higher pleasures', he despises television and other 'low class' things, which gives him a rather snobbish attitude. Ironically, in his time when he was a Master Criminal, he studied the uses of Dynamite, which would theoretically be considered low class. Beneath the cultured gentlemen is the heart of a cold blooded killer; Bob is a man who thinks nothing of hurting others to get what he wants, even if this includes himself. Bob's primary motive seems to be revenge; his original crime (framing Krusty the Clown) was an attempt to get back at him for making a clumsy fool of Bob for years as his sidekick, and most of his other crimes have been attempts at murdering Bart Simpson for foiling him. However, he has made several attempts at acquiring money and/or power, such as when he tried to kill Selma Bouvier or run a campaign for mayor as a republican (if for no other reason than to make the Simpsons miserable). Bob has a brother named Cecil, who was jealous of Bob for stealing his role during his audition for The Krusty the Klown Show and tried to frame Bob for fraud. His parents are Robert Terwilliger, Sr. and Dame Judith Underdunk. After moving to Italy and becoming mayor of a small Italian village, Bob had a wife named Francesca and a son named Gino. When Homer must go to Italy to get Mr. Burn's new sports car, they just happen to stop in Bob's village. Bob tries to hide his past from his new wife but is unable, contrary to Bob's fear, his wife and son try and help him kill Bart. Sideshow Bob declared himself an enemy of Krusty, as his role on the Krusty the Clown show was regularly cruel and demeaning. Since framing Krusty for armed robbery, Bob has attempted to kill him a couple of times. However, the last time Bob tries to, Krusty publicily confesses his regret for abusing him in his show by a singing a nice song for him as an apology, which touches Bob so much. With that in line, they seemed to bury the hatchet. He became Bart's nemesis after Bart figured out he had framed Krusty, getting him sent to prison. Ever since then, Bob has been obsessed with killing Bart, constantly plotting his revenge in prison. 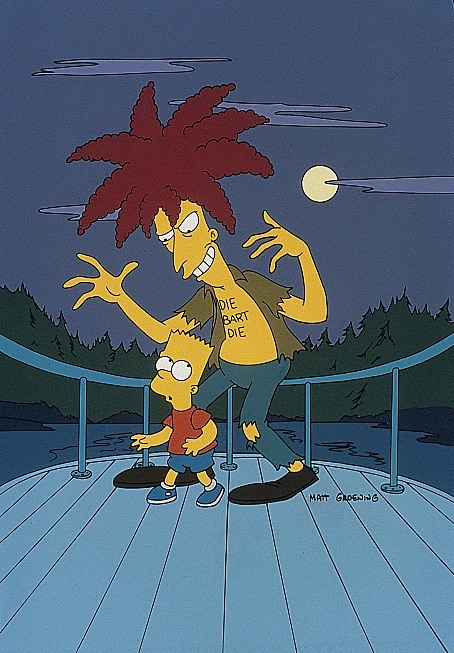 The first few times he was released from jail, Sideshow Bob would carry out a plan to murder Bart, or count it as a 'bonus' to one of his other schemes (the sole exception being when he was released under the prison Christianity movement, where he attempted to atone for his sins, and most notably does not desire to even hurt Bart at all). Eventually, he finally has Bart at his mercy, but lets him go as he has become "accustomed to his face. The closest thing Bob has to a catchphrase comes from this relationship: Sometimes Bob will reveal himself saying "Hello Bart" in a menacing tone, to which Bart (and sometimes Lisa, in unison) will exclaim "Ahhh! Sideshow Bob!". His occupation was to be Krusty's sidekick on the Krusty The Clown Show. He didn't even want the job: Bob accompanied his brother to the auditions, and unwittingly impressed Krusty enough to be hired on the spot. His job before this is unknown. He gave up on his sidekick job after he went to prison for framing Krusty, and has since become a master criminal (although the "master" part is spurious, as he has been repeatedly foiled by children. However, while being arrested the first time around, he is warning the adults to not look down on children as they were more intelligent than they appear as "they were smart enough to get me! ", implying that Bart and Lisa may have had intelligence above most average kids). 30 years in the future, it is apparent that Sideshow Bob is now deceased, after stepping on a rake. 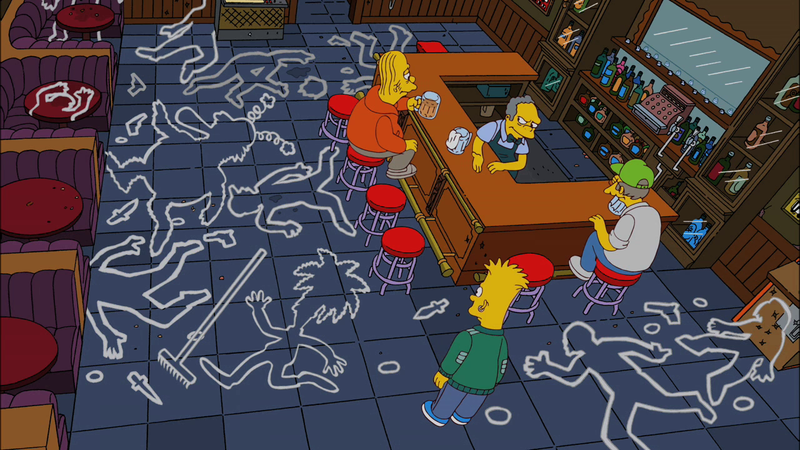 A chalk outline of his body can be seen in Moe's Tavern. 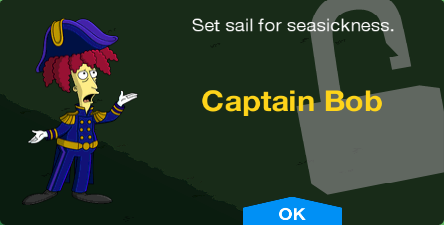 In the future, Sideshow Bob, as Elder Bob, lived in a lighthouse regretting trying to get revenge since he wasted his life doing it, he tells Squeaky-voiced teen that life is short and not too waste it on revenge. Sideshow Bob appears as the main antagonist in The Simpsons Ride at Universal Studios Parks. 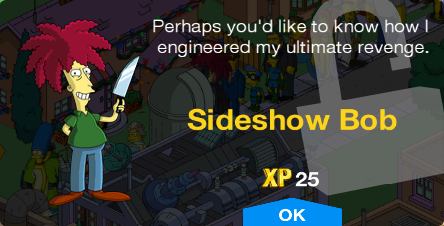 Sideshow Bob appears in Stage 5: Springfield Gorge carrying food for the Simpsons so they can gain health. Bob was included as a level boss in the 1991 video game Bart vs. the Space Mutants. In The Simpsons Road Rage, there is a "Wanted" sign of Sideshow Bob in Evergreen Terrace. 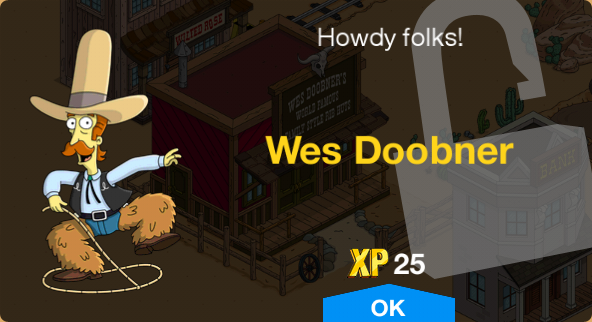 For some reason he is named as "Sideshow" Bob Roberts. Sideshow Bob appears at the end of Invasion of the Yokel-Snatchers to reveal himself as being in league with Kang and Kodos and prepares to do in Bart and Homer when he steps on a rake and knocks himself out. Prior to the Terwilligers event, Bob was a criminal that would randomly spawn in your town. You had to tap him to arrest him and get money and XP. 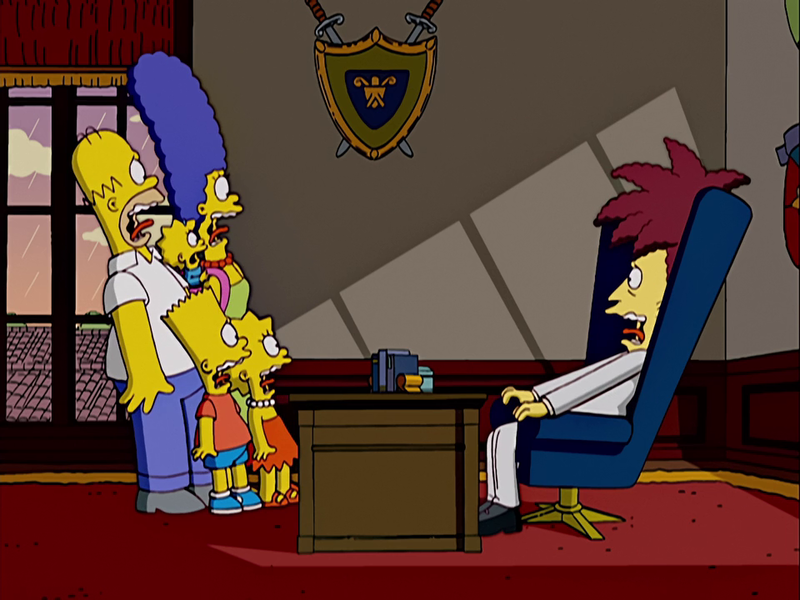 Sideshow Bob first appeared in the background of a scene in the season one episode "The Telltale Head". His design was more simple and his hair was round in shape. His first major appearance was in season one's penultimate episode "Krusty Gets Busted". Bob's design was updated for the episode, and the animators tried to redo his scenes in "The Telltale Head" with the re-design, but did not have enough time. 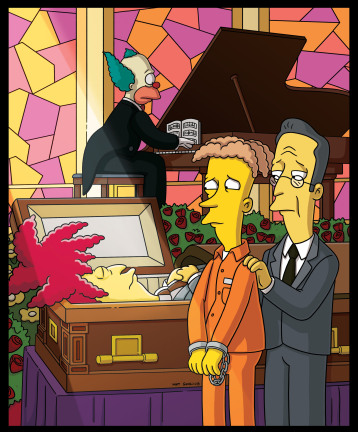 For season three's "Black Widower", the writers decided to have Bob return to get revenge on Bart for foiling his plan in "Krusty Gets Busted". They took the idea of the Coyote chasing the Road Runner, and had Bob always inserting himself into Bart's life. However, he did not appear in every season because the writers were not always able to think of reasons to bring Bob back. The script for "Krusty Gets Busted" called for James Earl Jones to voice Bob, but the producers instead went with Frasier actor Kelsey Grammer. Bob did not say anything during the first half of the episode, because the character always spoke with a slide whistle, and when he finally did speak, it would be a shock to hear Grammer's sophisticated voice. Grammer used his impression of Ellis Rabb, a man that Grammer had once worked for, for Bob's voice. Brad Bird first designed Bob for "Krusty Gets Busted". As the episode's animation progressed he made Bob sleeker, more urbane and refined, and worked with Grammer's voice. For "Black Widower", David Silverman updated the model to reflect the animation of Bird. 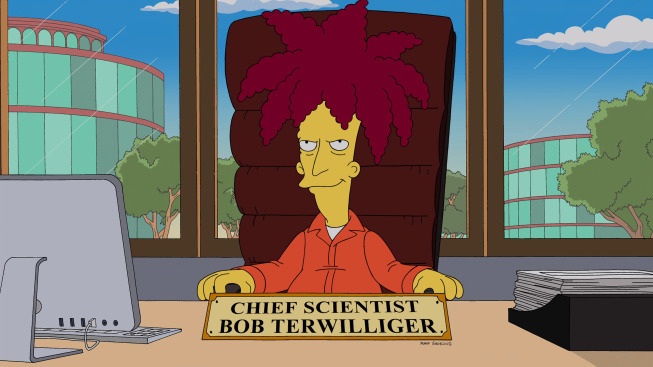 Despite common fan belief that Bob was named after Terwilliger Boulevard in Portland, Oregon, he was actually named after the character Dr. Terwilliker from the film The 5,000 Fingers of Dr. T.
In twenty one seasons of The Simpsons, Sideshow Bob has been heavily featured in ten episodes. Kelsey Grammer initially thought that Bob would be a one-time character, and calls him "the most popular character I've ever played." The writers believe that Grammer has a great voice and try to create something for him to sing in each episode he appears in. Grammer usually comes in for table readings, although when he cannot, Greg Berger stands in for him. Former Executive producer David Mirkin found Grammer a joy to direct as he was very funny, but noted that he hates doing the evil Sideshow Bob laughs. A rule for the early episodes that featured Bob was that there had to be a recap of his evil deeds in case the viewers did not remember them. The concept was dropped in later episodes. Sideshow Bob's theme, which is used whenever Bob gets out of prison, was first used in the season three episode "Black Widower", Bob's second episode. It is based on the score of the movie Cape Fear, which was composed by Elmer Bernstein. The musical score for "Cape Feare" earned composer Alf Clausen an Emmy Award nomination for "Outstanding Dramatic Underscore - Series" in 1994. Bob's prisoner number is often 24601, which is Jean Valjean's prisoner number in Les Misérables. 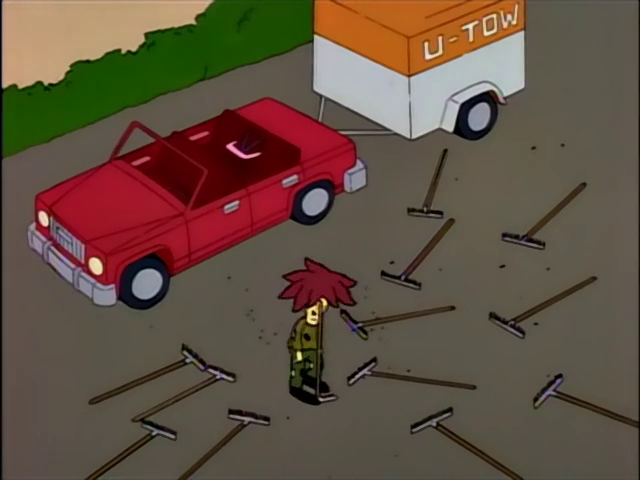 Another trademark for Bob is to step on rakes, a joke that first appeared in "Cape Feare". In that episode, Bob stepped on nine consecutive rakes, which the writers added to fill up time. The sequence has become known as the "rake joke" and has been referred to as being "genius in its repetitive stupidity". Grammer recorded lines for Sideshow Bob for The Simpsons Movie, but the scene in which he was to appear was cut. In a 2006 article, IGN.com ranked Bob in second position on their list of the "Top 25 Simpsons Peripheral Characters", citing that he is "a man of contradictions; his goofy appearance, complete with palm tree like hair, doesn't seem to match up to the well spoken and even musically talented maniac." Wizard Magazine rated Bob as the 66th greatest villain of all time. Kelsey Grammer has received praise for his voicework and in 2006, he won the Primetime Emmy Award for Outstanding Voice-Over Performance for his performance as Bob in the episode "The Italian Bob". Grammer had previously won four in the Outstanding Lead Actor in a Comedy Series category for his portrayal of Frasier Crane on Frasier. 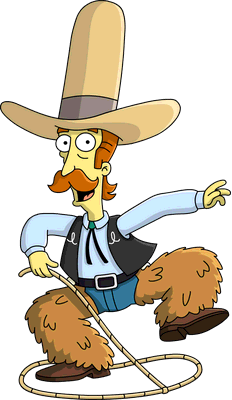 In a 2007 interview, Simpsons executive producer Al Jean listed Grammer as his second favorite guest star, saying "his voice is so rich". 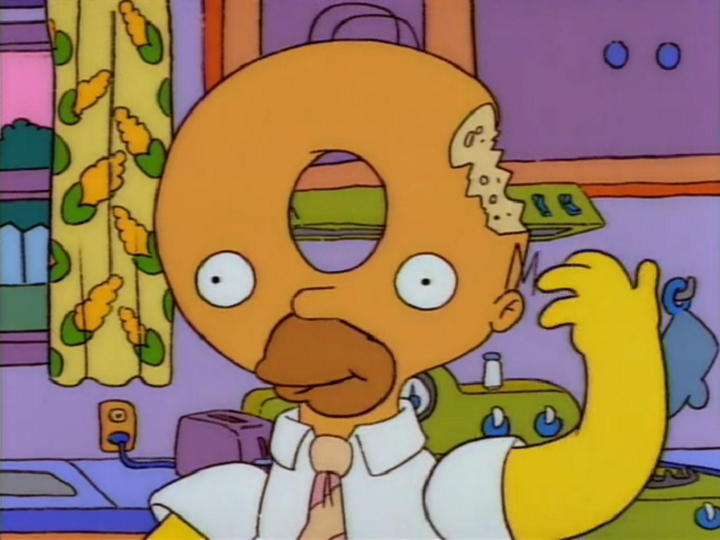 Mike Bruno of Entertainment Weekly called Kelsey Grammer one of "fourteen guest stars whose standout performances on TV make us wish they'd turn up in a Simpsons Movie 2". David Hyde Pierce was also included in that list. Ben Rayner of the Toronto Star listed "Cape Feare", "Sideshow Bob's Last Gleaming" and "Brother From Another Series" as being among the best episodes of the series, saying "Forget Frasier, these are Kelsey Grammer's best roles." The production staff on The Simpsons are usually excited about "Sideshow Bob episodes" as the writers consider them a treat to write, and the directors think they are always crazy and fun for them to animate. Many episodes featuring Bob have been well received by fans and critics. 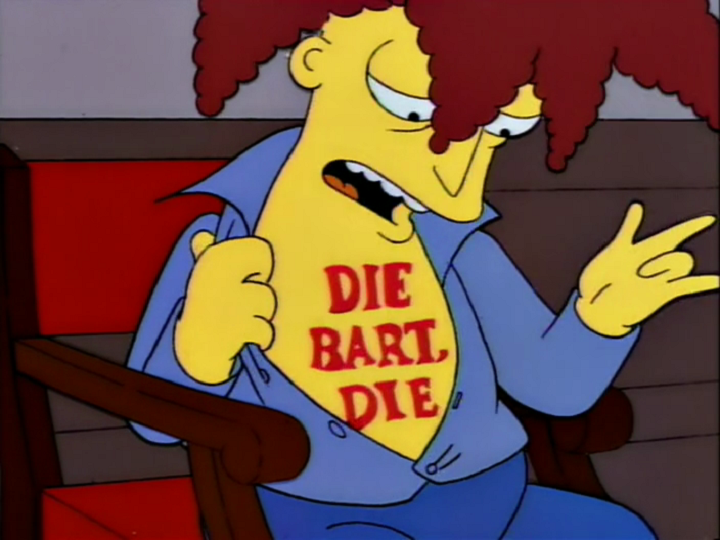 "Cape Feare", the third episode to feature Sideshow Bob, is generally regarded as one of the best episodes of The Simpsons, and according to Matt Groening, people often include it among their top 10 favorites. 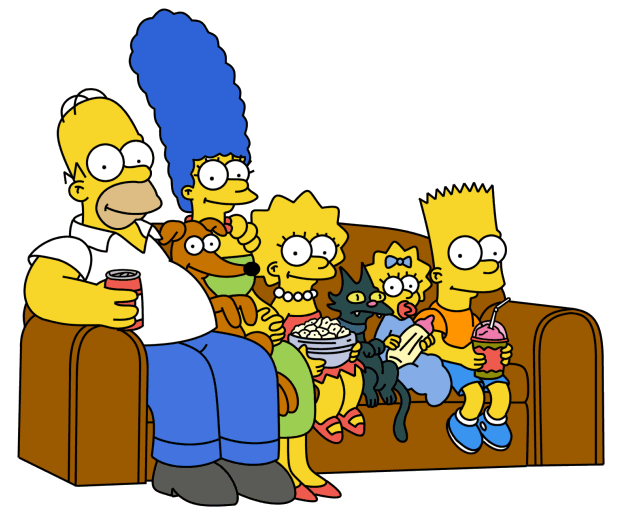 In Entertainment Weekly's top 25 The Simpsons episodes ever, it was placed third. 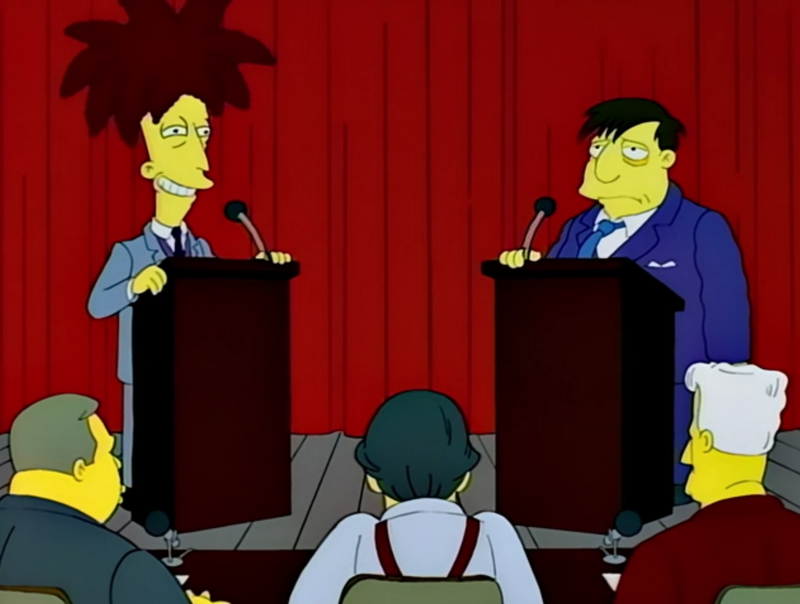 In 2006, IGN.com named Cape Feare the best episode of the fifth season. Vanity Fair called it the show's fourth best episode in 2007, as "this episode's masterful integration of filmic parody and a recurring character puts it near the top." 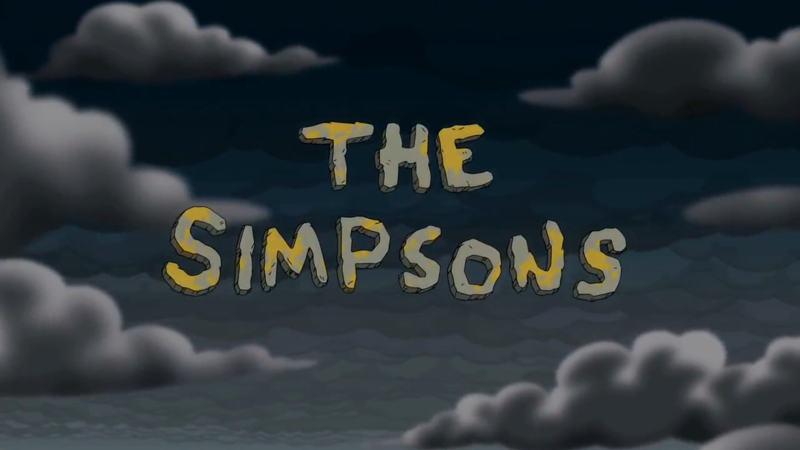 Associated Content chose the score for this episode to be 11th place of all of The Simpsons episodes. Grammer's performance of H.M.S. Pinafore was later included on the album Go Simpsonic with The Simpsons. The season 17 episode "The Italian Bob" and its writer John Frink would win a Writers Guild of America Award in 2007 in the animation category. Bob was made into an action figure, and two different versions were included as part of the World of Springfield toy line. The first shows Bob as he was on The Krusty the Clown Show, and was released in 2001 as part of the Krustylu Studios "Wave three play set". 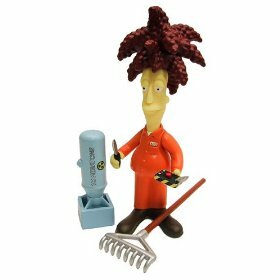 The second, released in 2002, has him in the prison uniform he wore in "Sideshow Bob's Last Gleaming", and was a part of "wave nine". Sideshow Bob is voiced by Kelsey Grammer who portrays Frasier Crane in the show Frasier. Meanwhile, Sideshow Bob's younger brother, Cecil, is voiced by David Hyde Peirce who portrays Frasier's younger brother Niles on the show. Also, Bob and Cecil's father, Robert Terwilliger Sr., is voiced by the late John Mahoney who portrays Martin Crane, father of Frasier and Niles Crane, in the show Frasier. He is not voiced by Kelsey, however, during the 'Krusty Disguise' scene from Krusty Gets Busted, in which his sole line, (in that scene, he had more lines in the episode itself, all done by Kelsey) 'Ow! My foot! You lousy, stupid, clumsy...!' was voiced by Dan Castellaneta. In some comic stories, Bob is seen out in public (e.g. in crowds) for unknown reasons. 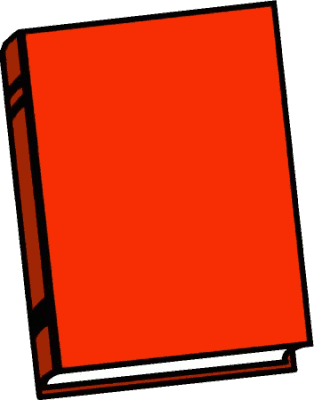 Couch gag – "(as a swordfish)"
Comic story – Get off the Bus! Comic story – ...Bart Simpson Shall Do My Bidding! Wikisimpsons has a collection of images related to Sideshow Bob. ↑ 2.0 2.1 2.2 "The Bob Next Door"
↑ 3.0 3.1 "Sideshow Bob Roberts"
↑ 4.0 4.1 4.2 4.3 "The Italian Bob"
↑ 5.0 5.1 "Funeral for a Fiend"
↑ "The Simpsons Road Rage"
↑ 7.0 7.1 7.2 7.3 "Brother from Another Series"
↑ 8.0 8.1 "Krusty Gets Busted"
↑ 12.0 12.1 "The Great Louse Detective"
Modified on March 25, 2019, at 04:06.